It's hard to believe it's been nine years since the last Fates Warning album. This seminal American progressive metal band, who preceded greats like Dream Theater and Symphony X, release their eleventh album, Darkness In A Different Light, this month. Fans will get a double delight as they will also be hitting the road for an extensive tour of Europe and America beginning in October. 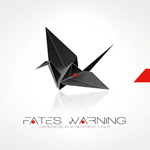 Fates Warning: in sparse territory. The core members since 1987, vocalist Ray Alder and guitarist Jim Matheos, remain. Frank Aresti (g) and Joey Vera return as well with new (as of 2007) drummer Bobby Jarzombek (Halford, Sebastian Bach, Iced Earth, Riot, et al). It's probably not fair to call Darkness In A Different Light a typical Fates Warning album, but fans will find themselves among friendly and familiar territory. However, the overall 'feel' of the album is heavier, edgier, yet sometimes characteristically moody towards somberness. Some of this comes from the music, some from Alder's vocal style. Certainly, you will not need to put this recording into the so-called commercial friendliness that Parallels achieved. Yet, you might find a song like Firefly to reach this with it's fluid and light melodic vocal line; and also the expansive twist on Falling as a bonus track. Read below. This is more strict, gritty sometimes dark, progressive metal. You get this with One Thousand Fires, a staccato paced number, Into the Black, a quick, guitar-laced, song, and And Yet It Moves. It's the longest number, most familiar Fates Warning, offering the swerves of prog with typical shifts in tempo and focus on particular instruments, including vocals, while pitting heaviness against lightness throughout. Thus the album title or perhaps not. Darkness In A Different Light arrives with several bonus tracks: an expanded version of Firefly, the surprising, and really good (like best song here), melodic rock of Falling Further (adapted from the short Falling earlier in the album), and two live tracks One, from Disconnected, and Life in Still Water from Parallels. While Fates Warning has never been my 'go to band' for American prog (like Dream Theater better), mostly because of the often despondent heaviness, Darkness In A Different Light is a strong return for Fates Warning. Not resting on former laurels, the band presses on with new ideas in the best tradition of progressive metal. Recommended. Darkness In A Different Light is a strong return for Fates Warning. Not resting on former laurels, the band presses on with new ideas in the best tradition of progressive metal.